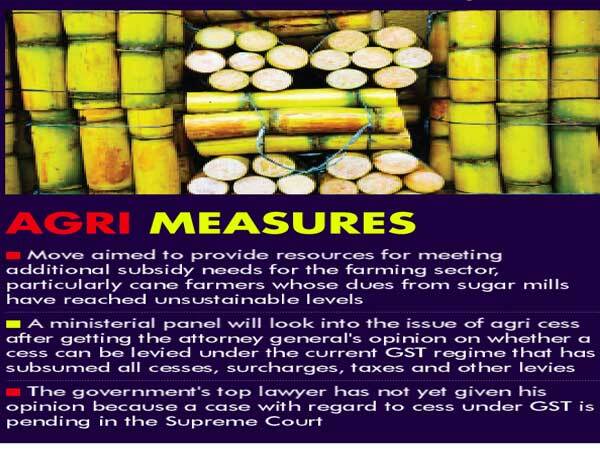 The GST Council may consider a fresh proposal to levy 1 per cent agriculture cess on luxury items to provide resources for meeting additional subsidy needs for the farming sector, particularly cane farmers whose dues from sugar mills have reached unsustainable levels. Sources said a ministerial panel (group of ministers), headed by Assam finance minister Himanta Biswa Sarma, will look into the issue of agri cess after getting the attorney general's opinion on whether a cess can be levied under the current Goods and Services Tax (GST) regime that has subsumed all cesses, surcharges, taxes and other levies. The GoM in its meeting on Wednesday junked an earlier proposal to levy sugar cess and decided to look at alternate mechanism depending on its legal validation by the AG. It would take the proposal to the GST Council in its meeting on July 21, if a favourable opinion is given. The GoM would also meet again before the council meet depending on legal opinion. The government's top lawyer has not yet given his opinion because a case with regard to cess under GST is pending in the Supreme Court. The GST Council in its last meeting in May had constituted the GoM to look into the food ministry’s proposal of imposing a cess of up to Rs 3 per kg on supply of sugar over and above the 5 per cent GST rate. The proceeds from the proposed levy, estimated at Rs 6,700 crore, would have flown into a separate fund to be utilised for interventions in the sugar sector and for cane farmers. Briefing reporters after the GoM meeting, Sarma said after fixing the minimum support price (MSP) for sugar at Rs 29 a kg, the arrears due to cane farmers have come down by Rs 5,000 crore to Rs 18,000 crore. “Considering this positive development, we do not think there is a case for levying cess on sugar at the moment,” Sarma said. Though he did not say whether another proposal on 1 per cent agri cess is on board now, an official in the GST Council said that this would be considered after legal vetting. The proposal of agri cess would load luxuries and demerit goods such as pan masala, aerated water and beverages, cigars and cigarettes, tobacco products, cement, paints, perfumes, ACs, dish washing machine, washing machine, refrigerators, vacuum cleaners, cars and two-wheelers, aircraft and yachts with additional 1 per cent levy. These goods are in top tax rate of 28 per cent under GST and some of them also attract additional cess charged at different rates. Concerned over rising farmer discontent over lower payments and the build-up of cane arrears, the Union cabinet last month approved a Rs 8,500 crore bailout package for the sugar industry to help the cash-starved mills to clear dues to farmers. It had also fixed a MSP of Rs 29 a kg. As the government’s finances are already stretched, there is a feeling that additional resource mobilisation is required to meet growing needs of the faming sector. The government doesn’t want to risk farmer’s backlash ahead of 2019 general elections. Prior to GST roll out on July 1, 2017, a cess was levied and collected under the Sugar Cess Act, 1982, as duty of excise for the purpose of the Sugar Development Fund. Through Taxation Laws Amendment Act, 2017 various cesses, including sugar cess, were abolished with effect from July 1, 2017. If the Council decides on levying cess on sugar a new legislation has to be brought in specifying the levy of cess and the proceeds of which will be going to a special fund to compensate sugarcane farmers. Meanwhile, the GoM also mooted GST reduction on ethanol from 18 per cent to 12 per cent. The food ministry though had been batting for 5 per cent rate.